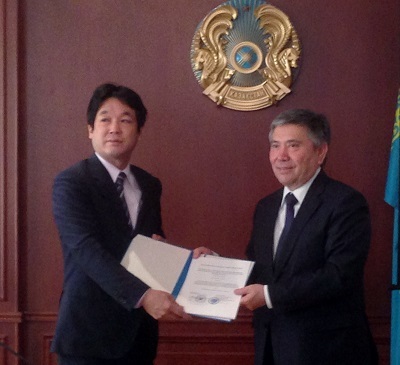 The completion ceremony of the Japan-Kazakhstan joint project for strengthening nuclear security (worth 432 million Japanese yen) was held on April 30, 2015 in the Ministry of Energy of the Repuplic of Kazakhstan, Astana city, with the attendance of government officials of the both countries. Kazakhstani First Vice-Minister for Energy U. KARABALIN expressed appreciation for the assistance extended by Japan in times of growing global terrorism, and added that assurance of nuclear security would help Kazakhstan to improve the credibility of its nuclear industry. Then, Japanese Parliamentary Vice-Minister for Foreign Affairs K. SONOURA pointed out the importance of continued concerted efforts between Japan and Kazakhstan in the sphere of nuclear security, noting that the both states co-chair the Conference on Facilitating the Entry into Force of the CTBT as the countries suffering either nuclear tests or atomic bombings. The joint project was implemented based on the Implementing Arrangement signed in November 2011 between the Japan-Kazakhstan Committee on Cooperation for the Destruction of Nuclear Weapons Reduced in the Republic of Kazakhstan and the Ministry of Industry and New Technologies (later reorganized into the Ministry of Energy). The whole range of works done under this project has allowed the Ulba Metallurgical Plant and the Institute of Nuclear Physics to maintain the robust physical barriers as well as effectively detect potential intruder threats; concrete fences, alarm sensors, video surveillance and communication systems have been upgraded. In addition to that, training was provided for the facility staff in collaboration with the IAEA.